Asian leaders, dismayed by American disarray on free trade, are warming up to “China-led” alternatives to the U.S.-led Trans-Pacific Partnership (TPP). But Beijing says it doesn’t want a leadership role forging the new pacts necessary to reinvigorate regional trade. It is understandable why China would want to duck the reputational damage TPP’s failure is inflicting on the United States, but the world’s second largest economy is in a leadership position now whether it likes it or not. China has bent over backwards to put itself in this position after being left out of the TPP, launching a regional infrastructure bank, pushing its currency into the IMF reserve basket, and investing heavily in promoting its “One Belt One Road” initiative, a massive diplomatic offensive which will deepen logistical links between China, Africa, Asia and Europe. With the election of populist Donald Trump as president-elect in the United States, seen as the death-knell of TPP, Asian leaders are naturally looking to China to take up the reins and help lower transaction costs for a region struggling with weak demand. 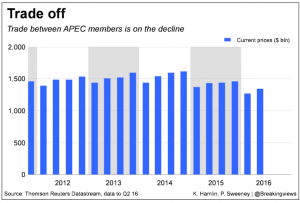 Trade between members of the Asia-Pacific Economic Cooperation forum has been declining since 2014 and was down around 6 percent in the second quarter, Datastream figures show. The ensuing pivot toward China has been dizzyingly fast; Vietnam has shelved ratification of the TPP, while Australia says it would support the Regional Comprehensive Economic Partnership (RCEP) and its more ambitious cousin the Free Trade Area of the Asia-Pacific (FTAAP). RCEP proposes to lower barriers to trade and investment between the ten ASEAN member states plus six other countries with which the bloc enjoys free-trade agreements, including China, Japan and Australia. The United States is not part of either deal. Now Beijing appears uncomfortable seizing a golden opportunity to push a stagnant negotiation process at U.S. expense. This begs the question of how committed China really is to Asian trade liberalization absent pressure from TPP, given any strong agreement would bring competition to its protected state industries. It is facile to gripe about U.S. hegemony, but hegemony and leadership are not the same thing. Asian trade needs the latter, and more of it, from China. "China does not seek a leading role in the Regional Comprehensive Economic Partnership (RCEP) and the Free Trade Area of the Asia-Pacific (FTAAP)," state news agency Xinhua reported foreign ministry spokesperson Geng Shuang as saying at a press conference on Nov. 18. The China-backed Regional Comprehensive Economic Partnership is seen as a front-runner for new free trade deals in the region, which would pave the way for a more ambitious pact, the Free Trade Area of the Asia-Pacific. The United States is excluded from RCEP. Obama last week abandoned efforts to win congressional approval for the U.S.-led Trans-Pacific Partnership before Trump takes office, saying its fate was up to Trump and Republican lawmakers. The TPP was not open to China. On the campaign trail, U.S. president elect Donald Trump labelled the TPP, championed by President Barack Obama, a "disaster". 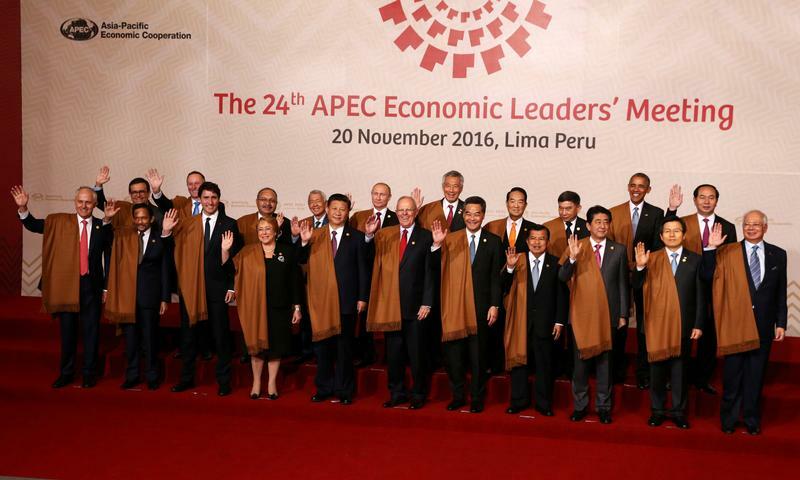 Vietnam will shelve ratification of the TPP accord, its prime minister said on Nov. 17. In an interview with the Financial Times published Nov. 16, Steven Ciobo, Australia's trade minister, said the country would support the FTAAP.